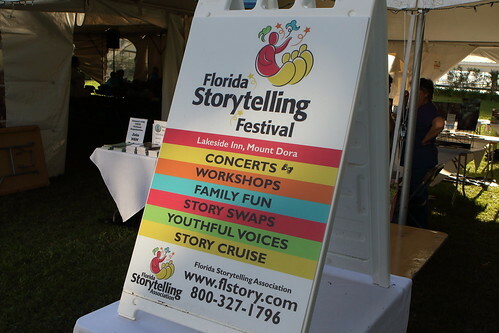 The Florida Storytelling Association is a non-profit membership organization that supports the art and craft of oral storytelling through community and connection. Our annual festival brings members together for listening, learning, telling, fellowship, diversity, and encouraging our youth. *Please consider volunteering to be a part of our Board of Directors. We have elections annually. We are storytellers, story listeners and story lovers. We are people just like you with a story to tell. In 1984, Jennifer Bausman and Annette Bruce, two women who loved storytelling, organized the first Florida Storytelling Camp at a rustic, Florida campground. It was so successful, a year later they founded the Florida Storytellers’ Guild. In 2000, we became the Florida Storytelling Association. workshops led by world-renowned storytellers. The weekend features storytelling concerts and, best of all, the camaraderie of other tellers. Today, beautiful Mount Dora is our home and host to The Florida Storytelling Festival. From its simple beginning, FSA has nurtured the growth and development of storytelling in Florida. Today we continue to grow, offering support for educational gatherings throughout the state and grants to local affiliates producing area storytelling festivals and concerts.